In a marathon session held 26 years ago, a teenager set the highest score ever recorded on the arcade game; the record has yet to be bested to this very day. 81 hours is a hell of a long time to play any videogame without sleep and without stopping for any significant amount of time. It's the length of time then fifteen-year-old Scott Safran of Cherry Hill, NJ, is said to have taken to set the world record in Asteroids. Safran dropped a quarter into the arcade cabinet on Nov. 13, 1982. Several days later, he broke the previous record held by gamer and actor Leo Daniels with a high score of 41,336,440 points. His high score has lasted for a quarter of a century without being broken, making it the longest lasting videogame high score record. Sadly, Safran died in 1989 at the age of 21 from falling off a roof. His high score legacy lives on. 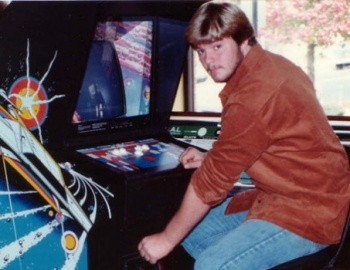 More recently, Bill Carlton, of Oregon, attempted to beat the record in 2004, but he failed miserably when the arcade cabinet malfunctioned after 27 hours of solid gameplay. His score reached over 15 million points. 81 hours? That is a testament to old styles of games, you could play them and play them and there was no 'end' unless it was a limitation issue such as Pac-Man's 256th level (256th right?). It must've sucked to be Bill Carlton, I reckon that put him off the game for life and hence there being no follow up attempt. He's probably up in heaven playing Asteroids right now. Longest lasting record for a videogame is impressive though. Maybe it might even make it to 50? Na, he's probably been sent to space by [insert religious figure here] to play with real asteroids, as a testament to his love of the game. I love that old game, I used to play one on my first ever computer and it was called Maelstrom I think. It was in 3D and was alot more fun than the original. Safran must have amazing talent when it comes to games, quick and precise along with alot of vitality to play for almost 4 days without sleep. I think thats the right word! Heh...completely coincidentally I was wearing my Stellar Defense Wing tee shirt on the anniversary. I had no idea about the record until they announced it on the news. Safran died in 1989 at the age of 21 from falling off a roof. Wow... either god took him or natural selection did. what? He fell of his roof... how'd that happen? I wouldn't be able to play any game for 81 hours thats for sure. I would probably pass out or just get bored with it. Kudoos to this guy though thats even more impressive that the first Pac-man score! 81 hours? Is that possible? Wouldn't your bowels or bladder explode from whatever substance he utilized to counter the most definite threat of malnourishment and dehydration? I'm very skeptical of that number. EDIT: Nevermind, missed the "for any significant amount of time" in my first read through. Carry on.